Engine Timing Belt Kit with Water Pump-Water Pump Kit w/Seals DAYCO WP306K2AS. Country of Origin (Primary) : CN. Harmonized Tariff Code (Schedule B) : 8413309000. Interchange Part Number : PP306LK1-MI, TCKWP306, PP306LK1. Life Cycle Status Code : 2. Product Description - Long - 80 : WATER PUMP KIT WITH SEALS, DAYCO. Product Description - Short - 20 : WATER PUMP KIT. See Item Specifics section for additional specifications about this part. To confirm that this part fits your vehicle, enter your vehicle's Year, Make, Model, Trim and Engine in the Compatibility Table. Also review the notes section in the compatibility chart for additional specifications about this part. This part generally fits Audi, Volkswagen vehicles and includes models such as A4, A4 Quattro, Beetle, Golf, Jetta, TT, TT Quattro with the trims of ALMS Edition Coupe 2-Door, Avant Confort Wagon 4-Door, Avant Luxury Wagon 4-Door, Avant Wagon 4-Door, Base Convertible 2-Door, Base Coupe 2-Door, Base Sedan 4-Door, Basico Sedan 4-Door, Classic Edition Convertible 2-Door, Classic Edition Coupe 2-Door, Confort Sedan 4-Door, GL Convertible 2-Door, GL Hatchback 2-Door, GL Sedan 4-Door, GL Wagon 4-Door, GLI 50 Aniversario Sedan 4-Door, GLI Sedan 4-Door, GLS Convertible 2-Door, GLS Hatchback 2-Door, GLS Hatchback 4-Door, GLS Sedan 4-Door, GLS Sport Turbo Hatchback 2-Door, GLS Turbo Hatchback 2-Door, GLS Turbo Sedan 4-Door, GLS Wagon 4-Door, GLX Convertible 2-Door, GLX Hatchback 2-Door, GLX Sport Turbo Hatchback 2-Door, GLX Turbo Hatchback 2-Door, GTI 1.8T Hatchback 2-Door, GTI 20th Anniversary Hatchback 2-Door, GTI 337 Hatchback 2-Door, GTI GLS Hatchback 2-Door, GTI Hatchback 2-Door, GTI Turbo Hatchback 2-Door, Luxury Sedan 4-Door, S Line Convertible 2-Door, S Line Coupe 2-Door, Sport Convertible 2-Door, Sport Coupe 2-Door, Sport Hatchback 2-Door, Sport Sedan 4-Door, Sportline Sedan 4-Door, Turbo S Hatchback 2-Door, Wolfsburg Edition Sedan 4-Door, Wolfsburg Edition Wagon 4-Door. The engine types may include 1.8L 1781CC l4 GAS DOHC Turbocharged. This part fits vehicles made in the following years 1999, 2000, 2001, 2002, 2003, 2004, 2005, 2006. This item may interchange to the following part numbers from other brands. Brands: CARQUEST/GATES, CONTINENTAL ELITE, CONTITECH, CRP/CONTITECH (INCHES), CRP/CONTITECH (METRIC-FULL), CRP/CONTITECH (METRIC-IMPORT), GATES, GATES CANADA Part Numbers: PP306LK1, PP306LK1-MI, TCKWP306. Grand Prix Automotive Distributors Inc. Today we are a full automotive parts supplier covering all of southern Alberta. Portions of the part information on this page have been provided by WHI Solutions, Inc. 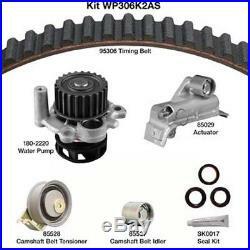 The item "Engine Timing Belt Kit with Water Pump-Water Pump Kit withSeals DAYCO WP306K2AS" is in sale since Saturday, July 15, 2017. This item is in the category "Automotive\Parts & Accessories\Car & Truck Parts\Engines & Components\Timing Components". The seller is "gpx1969" and is located in Calgary, Alberta. This item can be shipped to Canada.